G and I just read our second book to review. 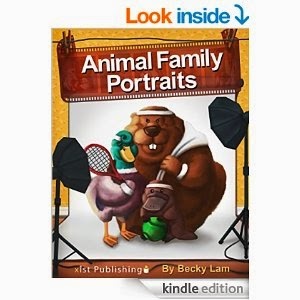 This one is called Animal Family Portraits by Becky Lam. You can get this wonderful book for $3.99 on amazon here. It is a picture book without any more reading than the names of the animals. G says: I like that book so much. We liked that there were so many cute animals. The group shown on the cover is Duck + Beaver = Platypus Baby. The Animal + Animal = Baby is all it says on the page before the picture. Some of the animal names are hard for young readers (and moms) to pronounce.